Happy Dog Ranch Foundation, Inc. hosts educational and equine therapeutic clinics for the benefit of people of all ages and all backgrounds. We are dedicated to providing an environment of harmony, happiness, and healing where nature and animals can work their miracles in transforming and enriching our lives. HDR is a place where we can all connect to our best selves, to help heal ourselves, our community and our world. 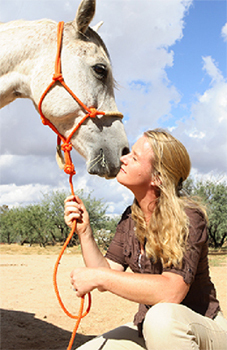 ​We offer clinics in equine-assisted personal development through the Gestalt Equine Institute of the Rockies and Epona as well as workshops teaching healing modalities such as Craniosacral therapy, massage, acupressure and TTouch for animals. We host clinics to improve our physical bodies and our relationships, on the ground and mounted, with our horses through Natural Horsemanship, Feldenkrais, Tai Chi, and Heart Math. Our clinicians and educators are known internationally, nationally and locally as some of the finest practitioners in each of their fields. A few of the many talented and amazing people and groups we have teaching at the Ranch are Linda Tellington, Richard Shrake, Anna Twinney (pictured on the left), James Shaw, Mark Rashid, Sharon Bringleson, Jim Masterson, Duey Freeman, Tallgrass Institute -- the list goes on and on. Take a moment to check out our Events page and see if something resonates with you!